A painful struggle goes on when a Buster Keaton fan attempts to view one of his post-Cameraman works. 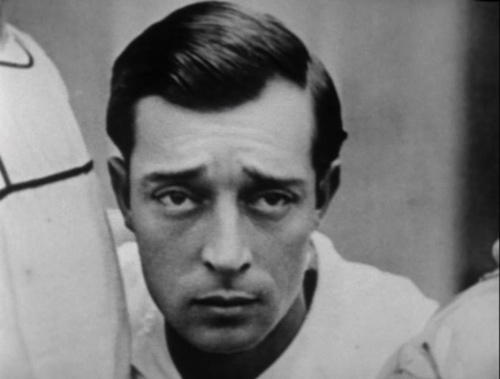 On the one hand, there is Buster, still looking cute as hell and still capable of doing wonderful things, though sometimes beneath ridiculous pants or stupid clown makeup. . . . On the other, it is impossible not to notice how badly MGM missed the point of this man and you wonder how they could have gotten it so wrong. So, when people speak of movies like Free and Easy as "only for the Keaton die-hards," I think they've got it all wrong. In the case of these MGM travesties, it is Keaton fans that have the most to suffer when we see his talent being thrown away. Others need not feel that particular pain. 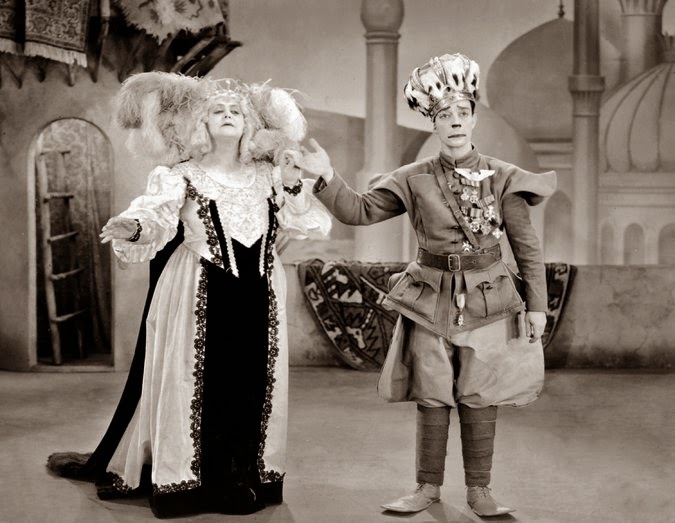 This film is actually best suited to those fans of early cinema who are not attached to Keaton. Those folks won't have to suffer like we do when we see him in something so far beneath his talent, trying gamely to go along. However, they will get to see what provides a surprisingly interesting behind-the-scenes glimpse into movie-making inside the MGM studios circa 1930 -- right at the dawn of the talkies and the powerful studio system. I mean, talk about a rare opportunity. And speaking of the sufferings of the Keaton fan..., a profoundly sad example comes on this very train ride when Buster's Elmer is being told off by the conductor who says he can't go through the train to where the girl and her mom are waiting. Just two years prior, Buster would certainly have climbed atop it and run to the proper car, probably jumping through a window without pause to get to where he wanted to be..., while here sits Elmer chatting with the conductor on the back end of the train while the girl's mom soundly abuses his stupidity. Heartbreaking. There are plenty of kernels of ideas that just don't get handled well, and it is therefore not very watchable for the most part. At two different times I nearly turned it off -- but was glad I didn't, because there were other parts that were very cool. I actually liked Buster's interaction with his rival at the apartment when they both discover they're from Kansas and find a connection -- getting excited about husking corn. There is some chemistry and interest, and there is Buster with his naturally engaging comic presence. And, later, when Buster is singing and dancing, he just can't help but exude talent. The musical number "King and Queen" was fascinating. As was Buster's performance in "Free and Easy." But neither these moments, nor the corn husking scene, really helped the underlying plot in any way. Its not that they couldn't have in the hands of a better production, but they were just odd little snippets that made little sense. And sadly, the odd snippets were worth more than the underlying story. All that said, the best part of the movie is the inside glimpse into MGM studios. You can see the stage sets, the cameras, the directors, the entry gate and other behind the scenes workers - security guards, etc. - doing their thing. More amazing are the numerous cameos done by actual MGM directors and actors in this film, playing themselves in order to be part of the authentic backdrop of our characters' experiences on set. (These include: Cecil B. DeMille, Jackie Coogan, Fred Niblo, William Haines, William Collier Jr., David Burton, Arthur Lange, Billy May, and probably others.) There is a movie premiere event within the film, which was actually filmed at Graumann's Chinese Theater, complete with red carpet moment, that allows you feel the era in an astonishing way. These things are done as a basic, accurate, backdrop and are probably oozing with authenticity. They represent a very "real" moment in cinematic history that are worth seeing. And it is probably worth putting up with a fairly so-so movie in order to see them. Free and Easy is so painful. It took me two times to get through the whole thing. That ending in particular drives me mad, because the sentimentality and Paggliacci BS is so anti-Keaton.